The boom boom Shahid Afridi has now ventured into food market by launching “Splice” Restaurant Chain in Pakistan to serve South African taste here. After launching fashion brand, the famous cricketer Shahid Afridi has introduced another chain under his name which is “Splice” restaurants opened in Q-Block Gulberg, Lahore. The Splice restaurants have its root deeply embedded in the heart of Africa and are from the Splice Signature Restaurants, head office. 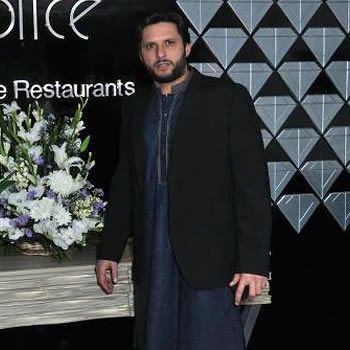 The inauguration of Shahid Afridi’s Splice Restaurant Chain was done by Imran khan as the honor guest and the attendees included celebrities like Atif Aslam, Moammar Rana, Humayun Saeed, Arbaz Khan, Rambo and Sahiba, Inzamam-ul-Haq, Wahab Riaz, Mushtaq Ahmed, Umer Akmal, Muhammad Amir and many other renowned faces. All of them wished good luck to Shahid Afridi who now has plan to launch the restaurant all across Pakistan very soon.